It’s Tuesday and you know what that means? 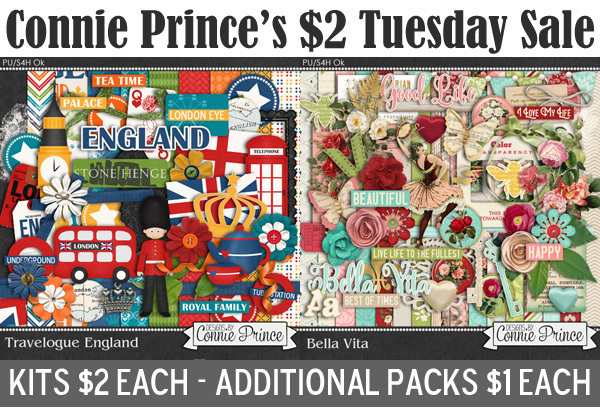 Two of Connie’s lovely kits are on sale for only $2 each for today only! This week Connie has the lovely Bella Vita and the fabulous Travelogue England on sale. Those layouts are stunning! Connie just released another addition to the Travelogue series on Thursday of last week this time taking you to the state of Delaware. You can pick it up today and tomorrow for 40% off before it goes to full price. Did you know that all of Connie’s Travelogue series kits were made to work together? What and awesome way to create a HUGE mega stash collection to pull from! You can find Travelogue Delaware at Ginger Scraps and The Digi Chick. Looking for more ways to build your scrapping stash and save money? Check out the three kits that Connie has in the Ginger Scraps June 2018 Bake Sale! Each kit is only $1 through the 20th. Stop by the Ginger Scraps blog each day in June to pick up a piece of the June Daily Download Kit - Moving Day by Connie Prince & Trixie Scraps!! Now that you’ve gotten caught up on all of Connie’s news how about a freebie from Connie’s fantastic CT? CTM Judy created this beautiful cluster with Bella Vita for today’s freebie. Enjoy! What a pretty cluster. Thank you!